There are various causes of low back pain, coming in different forms – some people experience a dull ache, while others have a sharp pain. Some experience pain that radiates into the back of the leg while others suffer the pain right into the foot. The back is made of various musculoskeletal components, and the role of these elements in various movements makes the back an important part of the whole body. Regardless of the nature of the pain and how it makes you feel, one primary muscle that is involved in causing back pain is the Psoas, or perhaps more accurately – the Iliopsoas muscle. This muscle is shaped in the form of an “S” and runs down the five lowest spinal vertebrae, through your pelvic region ending in the femur bone. You have two of these muscles, one on either side of the body. The psoas is involved in various movements, but one of the major tasks of this muscle is to stabilize your lower back whenever you lift the knee upwards. It is also critical for body balance, and you use it when executing basic body movements such as walking, bending forward and tilting to one side. The muscle also helps you stand up from a sitting position, sit up from a lying down position and helps you to walk. It is vital in day-to-day life. This muscle is responsible for your muscles’ and joints’ range of motion; therefore, if you have a psoas muscle that isn’t working correctly, you diminish your range of motion. What Causes Injury to the Psoas Muscle? A sedentary lifestyle and lack of activity can lead to contraction of the psoas muscle. When the muscle contracts, it leads to stiffness and consequent lack of mobility in your lower back or hip area. You will also experience issues with the iliopsoas muscle due to strain, contracture, spasms, and tendinitis, which is an inflammatory condition that affects the muscle. You also get a contracted psoas muscle if your back is misaligned. Misalignment causes the back to lean more to one side of the body as compared to the other. This can cause contraction of the muscle and result in other types of back pain as a result of sciatica and bulging discs. One of the major symptoms of back pain due to a contracted psoas muscle is back strain that doesn’t go away even with proper treatment. Instead of getting better, the condition even gets worse. The pain characteristically spreads from the lower back to the mid or upper areas, or it spreads to the surrounding regions of the anterior part of the hip. The condition might also accompany various other conditions that affect the low back. It might even cause chronic low back pain that doesn’t go away easily. This condition is more common in various professionals such as athletes and office workers who spend most of their times sitting. When it comes to sports, this condition is more prevalent in hockey, dance, and soccer. When overworked or when it becomes too weak to handle the strain that is imposed on it, this muscle can go into spasm and tear. Tears in the muscle can heal but might lead to scarring that will cause weakness and pain. The surrounding muscles compensate and become painful and tight as well. When the muscles compensate, they can lead to herniation of the disc at levels L4 and L5. This muscle is misunderstood by many people, and it makes it difficult for the patient to pinpoint the location of the pain. The patient also has a delay in achieving a fully erect posture when standing up. In all these, the most characteristic feature of the pain is that of lower back pain that gets to spread to the rest of the back, the gluteal area, the hip regions and even the groin. You might experience initial pain when you rise from a seated position. Standing for some time might also result in pain. This pain doesn’t manifest itself when you lie down or when you walk unless it is severe. Relief of the pain is experienced when you sit down. Extending the leg when driving makes the pain worse. The pain also gets worse when you twist at your waist without moving the feet. Adopting any position that shortens the psoas muscle for more extended periods of the time can lead to spasm. This is possible when you sleep in a fetal position for long, sit for extended positions of time or when you work in a crouching or kneeling position. A tear in the psoas muscle occurs when there is a forceful contraction. The damage can occur when you run up a steep slope, or perform an action such as kicking a ball or martial arts. 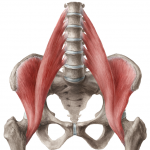 How Does a Contracted Psoas Muscle Cause Pain? When the psoas muscle contracts, it shortens and pulls the spine into a condition called hyper lordosis and leads to an over-arched low back. This posture places a lot of strain on the spinal muscles, including an important muscle called the erector spinae. It also puts a strain on the vertebral joints, causing pain. Low back pain also results when a tight psoas muscle leads to tension on the tendon that attaches the psoas muscle to the lumbar spine. While the tension occurs in the muscle, you feel the pain in the lower back. The tension can also affect the spinal nerve roots, which results in nerve pain. This is why you feel the pain radiating to other areas of the body and lower body. A contracted psoas muscle will pull and twist the vertebrae, which in turn causes compression of the vertebral joints and discs. The compression causes pain and gradual degeneration of these structures over time. This results in structural damage such as degenerative disc processes and potential herniation. It’s worth mentioning that education is key for most people when rehabilitating their back. A specialist back pain book can be worth it’s weight in gold and allow you to fully understand your treatment process and to avoid the injury recurring in future. The location of the iliopsoas muscle and its roles in the back and hip make it hard for a doctor to get his hands on it during the examination. It is tricky to get to and reach manually; therefore treatment of any issue that results needs a qualified professional who can rule out any other conditions. The aim of any treatment strategy is to correct lifestyle problems that might be causing the pain in the psoas muscle. If you are working at a job that requires you to sit for several hours, you need to get some time to stand up now and again to stretch the muscle. Or maybe you need to start improving your walking posture. Secondly, you need to loosen up the psoas muscle by developing a daily habit that allows you to stretch this muscle, doing this consistently helps relax the muscle and loosen the tension that has built up over time. You might also need to get to a medical professional for assessment and treatment of the condition. The qualified professional will perform a physical examination and rule out any other conditions to make sure it is a condition affecting the psoas muscle. You can also go natural when it comes to treating this low back pain. Combining natural remedies such as turmeric, cayenne pepper & CBD oil with stretching gives you the ability to get relief faster.